Web Racing is the feature of NetAthlon that allows users from anywhere in the world to participate in a common virtual athletic event. Using the Internet, NetAthlon can connect users of stationary fitness equipment for a common athletic training session or competition anytime, anywhere. NetAthlon offers a Spectator View feature to allow spectators to observe the event in real-time from any Internet-connected PC. The Fun of Virtual Competition is a few clicks away! Fitness machines can be linked together using NetAthlon software to provide life like indoor-outdoor activities including virtual training and competition. 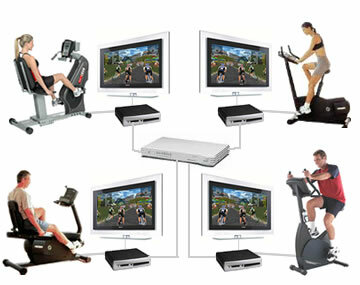 Network solution for three or more fitness machines. 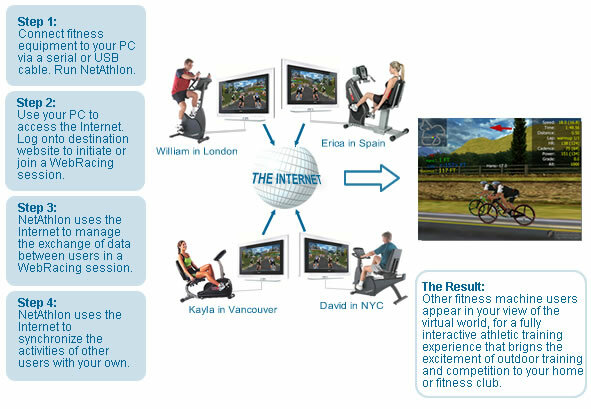 Using the Internet for Web Racing allowing remote training or competition asynchronously. 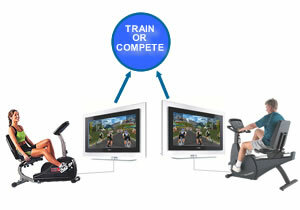 Two fitness machines can be connected together using a USB network cable, peer-to-peer connection using two network cards and a cable or a network hub, or via a wireless networking solution for two devices without a hub. Pacers in the events can be real or virtual, just as in individual training. Three or more fitness machines can be connected together using peer-to-peer USB cabling, or using an Ethernet network hub where each fitness machine has a computer and a wired or wireless connection to the hub. Networks lend themselves to having a "Spectator Cam Computer" so others can view the action with our special " Spectator Cam™" viewing mode. Pacers in the network can be real or virtual. NetAthlon Event Edition is a one-click solution. Emulates the outdoor experience with real-time environment sounds and digital backgrounds. Other athletes can join or leave a training or competitive session and try to catch - "Just like real"
Supports up to 8 users per session in NetAthlon 1.0 and up to 16 users per session in NetAthlon 2.0. Incorporated in every copy of NetAthlon® 1.0 and 2.0 FREE. Easy to set up - a few mouse clicks starting on the front page of NetAthlon® and you are online and competitive. You can make appointments with other users via E-mail, Yahoo groups, etc. FitCentric offers two ways to Web Race®: using our server or using the GameSpy server. Both are available to NetAthlon® users 24 hours per day.